As the enjoyment and warmth of last weekend's trip to the beach fades into a nice memory, I was reminded that I had not yet shared the best image of the weekend. 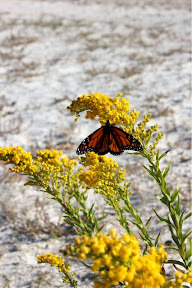 Chris, in one of those incredibly lucky and creative moments came across a monarch butterfly on a yellow flowering plant against the white of the sand. The butterfly posed for her and even changed positions so she could get a better shot of it. And so, here it is--one of those we happened to be in the right place at the right time and with camera in hand images.